"The Modern Catchier in the Wry"
Storytelling is often left on the backburner for games because the gameplay is the main attraction, and it can be difficult to keep a narrative going without feeling contrived. Then you get games like Nights in the Woods, which manages to resolve these issues by taking a more stream of consciousness approach to its writing and to its gameplay. This results in an experience that always feels spontaneous in its execution. As you might expect with these games, the gameplay is not substantial, especially if you expected puzzles based on the adventure game description. Instead of creating detracting elements to the narrative, the moments of gameplay add further context and world-building to Possum Springs. The difficult question for reviewers is to ask themselves why Nights in the Woods works better as an interactive experience rather than a book. After my experience with Oxenfree, I was afraid this game would also not be tailored to me; the Millennial dialogue and the threadbare gameplay further put me off. Upon completion, this question remained unanswered with mixed feelings, though with enough reflection on the stream of consciousness design the interactions perhaps work better than they have any right. It may not be an enlightening or satisfactory answer, but sometimes words are inadequate to express the sentimental value of pressing buttons, a characteristic that defines Nights in the Woods from beginning to end. Though stream of consciousness describes the rambling thoughts of an individual, Nights in the Woods is not a story solely about Mae Borowski but one of Possum Springs. Having reread Catcher in the Rye for the 18th time after finishing the game, the thematic parallels are more obvious than you think. Maturity meaning something more than a number; socioeconomic hardships and expectations to define adulthood as depressing than desirable; mental health and those deemed as outliers to normalcy; political undertones that define the current generation and the questions they raise whether they are material or spiritual; and the ever prominent, unnerving fears of tomorrow that go beyond death but who and what we leave behind. None of these topics are things the game avoids discussing, however brief it may seem, and their inclusion gives the world more realism than if they were removed. It’s these aspects of the story that will remain beyond its obvious 21st century influences, which may date the game from how you feel about its writing. In terms of gameplay, Nights in the Woods remains aware of its mechanical deficiencies by making them add value to tell its story. Mini-games come and go ranging from the many one-off moments like the dreams, the simplistic Guitar Hero songs, the flavor choices in dialogue, and the NES styled Bloodborne mini-game. 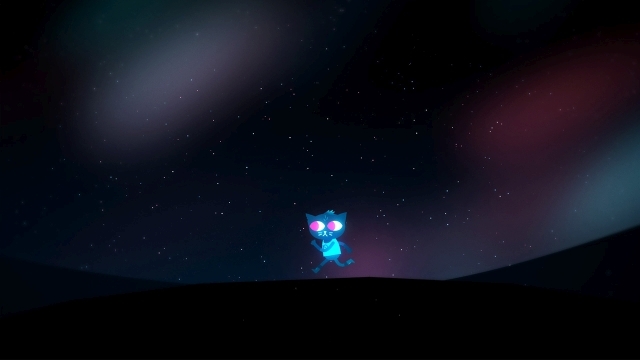 These moments incorporate the player’s failure or success to add personal investment, though shallow, to the narrative, and they remain within the limitations of Mae as a character. (It’s no oversight that Mae plays bass, not the lead guitar, as she provides some rhythm each day to the town despite being in the background.) For example, choices are not options players use to find the answer but more insight into Mae, which will often make players say or do something they know is wrong. You also cannot do everything in one playthrough, so there is some means of replayability. Although the repetition of each day may grate some players, there is a narrative purpose to serve as a college dropout scenario as it portrays the feeling of being aimless--almost to a fault. This ebb and flow that defines the gameplay and the storytelling is something Nights in the Woods manages to often strike a balance despite its shortcomings in both categories. Within the twelve hours it will take most people to complete the game and the side-stories, there is always something to keep players engaged. However, if there is a major flaw besides the repetition, it’s the execution of how many important plot threads remain unanswered versus the superfluous plot that feels out of time and place to the whole game. Out of all the plots the game could have resolved, the mystery surrounding the supernatural elements is the most bizarre choice to end a story grounded in realism. This criticism isn’t to say there is anything wrong with the supernatural elements as they do provide something of a moral essentially about carpe diem for family and friends, but the choice to provide it most complete narrative is jarring. The mystery is one of many narratives that becomes forgotten within the span of the game, which only comes back into focus in the final acts. Afterwards, like the other many unresolved stories of Possum Springs, it becomes something the characters simply wish to forget. This result would be tolerable if the other important questions about the more realistic matters were given the same closure as much as the mystery was resolved, such as what Mae intends to do after being a college dropout, yet the story simply comes to an end. Now this explanation is not entirely true; there may not be solutions to every problem in life, but the people of Possum Springs will try to find them. Many residents of Possum Springs find their own way to move on ranging from Mae’s father starting up a union strike to someone finding a new place to live. The player can assist certain characters find their resolutions like the homeless man behind the church and Selmers with her poetry. Again, these choices do not majorly affect the characters’ futures but what the player learns from them. The only major decision the player can directly influence is one final conversation between two friends based on who they spend the most time with, though each ending implies something about what Mae learns from them. Between the two, the ending with Gregg is perhaps the more suitable solution as it implies Mae will finally leave her home town; the other alternative is that perhaps Bea will give Mae some direction or purpose in life. Neither ending feels lopsided to treat it as the better solution, so it’s relative what character and what values you believe will help Mae better herself, a lesson the game emphasizes throughout it has less to do with your own abilities but those who you care to give the time to listen to their stories. Though it may sound presumptuous, Nights in the Woods may become a game that defines a generation like Earthbound for the ‘90s, though what generation will connect with it the most is not clear. You may assume young adults will likely identify with Mae and her friends as well as the story’s more petty conflicts like social acceptance and the value of the Internet. This preference changes as the more serious matters come into focus, though never long, like depression. Even if an adult cannot relate to these situations, the background details help them understand the upbringing of these adults acting like children. Perhaps, as unlikely as it may seem from the mature themes and language, it’s meant for the next generation who see these issues in life but don’t understand how they came to be or why the world is the way it is, and these characters may broaden their own understanding. Whomever the story is meant to connect with--however weird, alone or mature they may think they are--the names of Possum Springs will be difficult to leave. Once you’ve heard their stories, you begin to miss everybody. If you enjoyed this Night in the Woods review, you're encouraged to discuss it with the author and with other members of the site's community. If you don't already have an HonestGamers account, you can sign up for one in a snap. Thank you for reading! None of the material contained within this site may be reproduced in any conceivable fashion without permission from the author(s) of said material. This site is not sponsored or endorsed by Nintendo, Sega, Sony, Microsoft, or any other such party. 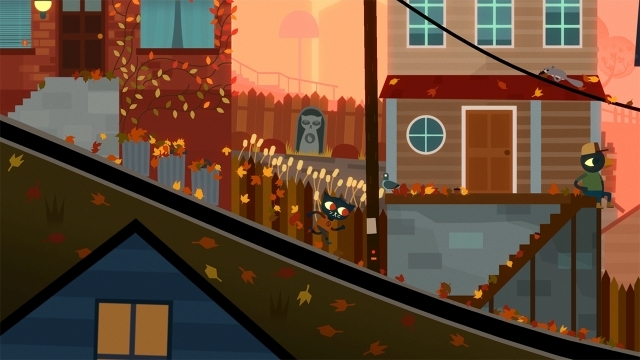 Night in the Woods is a registered trademark of its copyright holder. This site makes no claim to Night in the Woods, its characters, screenshots, artwork, music, or any intellectual property contained within. Opinions expressed on this site do not necessarily represent the opinion of site staff or sponsors. Staff and freelance reviews are typically written based on time spent with a retail review copy or review key for the game that is provided by its publisher.